Attend the 18th Caballo Blanco Ultramarathon on Sunday, March 1, 2020! Day 3: Start hike: elevation gain/loss: +/- 1200 ft (400m), 14 miles (24km), 9 hours. Camp in a high, picturesque valley. Day 4: elevation gain/loss: +/- 1200 ft (400m), 10 miles (16 km), 9 hours. 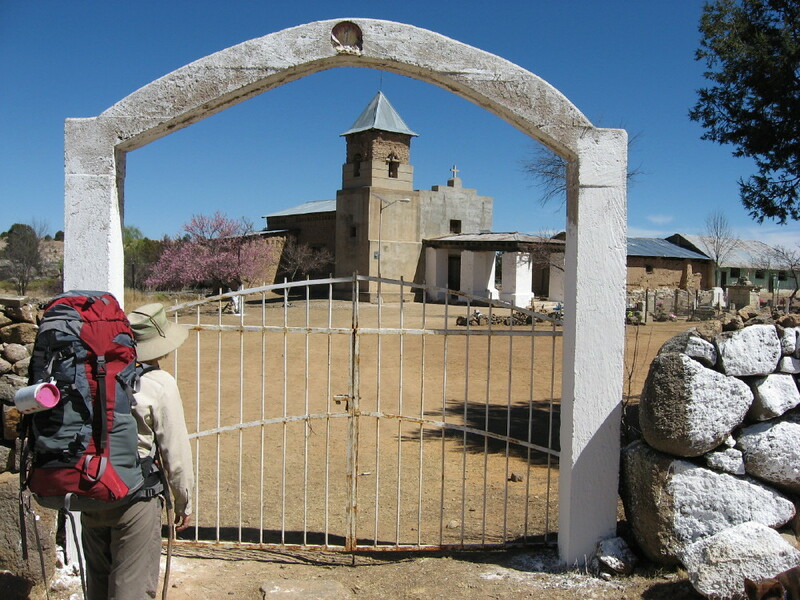 Camp outside an historic Mestizo village. Day 5: elevation gain/loss: +/- 400 ft (150m), 6 miles (10 km), 7 hours. Camp/homestay in a local rancho. Day 6: elevation loss: -3000 ft (1000m), 8 miles (13 km), 8 hours total. Local transport to in Urique final 8 miles-2000ft/600m descent. Campground in Urique. Day 7: elevation gain/loss: negligible. Optional Day hike to Guadalupe Coronado! ; Campground in Urique. Jesuits established missions throughout the Copper Canyon. Day 2: Start hike: elevation gain/loss: +/- 1200 ft (400m), 14 miles (24km), 9 hours. Camp in a high mesa. Day 3: elevation gain/loss: +/- 1000 ft (300m), 10 miles (16km), 8 hours. Camp at village edge. Day 4: elevation gain/loss: +/- 900 ft (280m), 6 miles (10 km), 7 hours. Camp at a rim-side rancho. Day 5: elevation gain/loss: + 400 ft/- 3000 ft (+150m/-1000m), 8 miles (13 km), 8 hours. Camp/homestay in El Naranjo village. We've hiked this route for the last few years, and it's such a great route; and Urique is such a fun town, that we thought we'd offer it to anybody who would rather walk than run. As with our other trips, it starts at the CHEPE train stop in Divisadero. This itinerary is not a loop however, and finishes by leaving on public buses from Urique for the CHEPE stop at Bahuichivo and onward to Divisadero. Compare to 9-day Rio Urique with burros, or 10-day FLOATPACK. Pack light (45 pounds/20 kilos maximum) -all gear goes with us to Urique.